THELMO PAROLE. 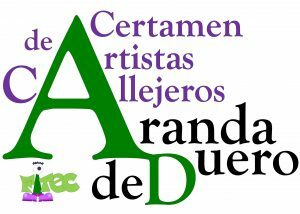 Winner of the Street Artists Contest of 2018 Aranda de Duero Parties. On the occasion of the 2017 Battle of the Year Iberia Championship, qualifying of the Battle of the Year 2017 International Championship (BOTY), which will take place in Germany in October 2017, bringing together the winning groups from around the world, FITEC has decided to of its programming this championship. 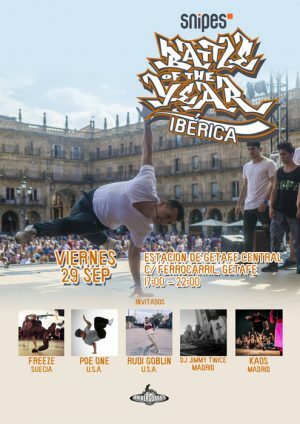 Once again, thanks to Universobboy and FITEC, we have the pleasure of celebrating the Breakin Scenic Shows event par excellence: Battle of the Year Ibérica, where the first prize is a direct qualifier for groups from Spain and Portugal to the end of Battle of the Year International to be held on October 21, 2017 in Germany. Two years ago we represented, apart from marking history, ArcopomCrew… Who will be the chosen in this edition? The FITEC within its objective of promoting the performing arts world, launched this year a new training space within the Entre-Espacios program. this time with Butoh Dance Wordshop 3 hours with Valeria Geremia (Italy). The seminar is open to all, it does not require previous experience in dance, no age limits. It is oriented not only dancers, but all those who want to make a path of research and emotional and artistic experimentation. That is the value of small corners of our house or our gardens or parks that took our elders, the value of having the capacity to accommodate all the dreams that one is able to imagine. The coming days will come to the streets of the city, “our-yours” FITEC, and we intend to convert these spaces of our Getafe in the small-large corner where come true our dreams, that fantasy that is still part of us, a box to hide dreams, those that we get to light with each new edition of the festival… the FITEC, the place where our dreams are hidden. The FITEC, is open to new proposals, which year after year, flooding the streets, squares and urban spaces of the city with art and color, and in this nineteenth edition of 2016 would not be less. Of the hand Coulturearte collective of Getafe, we arrived in the proposal for the metal shutters of shops in Getafe, a meeting of graffiti that transform them into a museum of urban art during the days of the Festival. We got down to work, and thanks to the invaluable collaboration of city merchants, launched this contest Graffiti on closures that will transform the streets of Getafe in an open Museum of Urban Art. We invite you to participate in this contest; and festival-goers to visit participating retailers and enjoy their graffiti during the days of celebration FITEC, from 30 September to 2 October 2016. You can find all relevant information on the terms and conditions of the competition then and/or descargaros Bases in PDF format.